On May 8 the GFMS, or formerly the Gold Fields Mineral Survey, issued its annual World Gold Survey. And despite the fact that demand has fallen here in the first quarter of 2018, along with central banks still implementing suppression tactics in the paper markets, members of the GFMS are forecasting the gold price to end the year above that of 2013, and potentially as high as $1500 per ounce. We expect gold to average $1,360/oz this year and potentially briefly approaching $1,500/oz later in the year as we believe that the geopolitical climate and equity markets will continue to support gold’s role as a risk hedge. 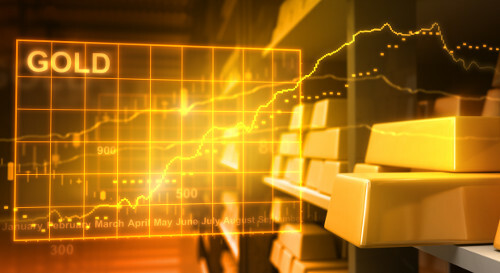 Uncertainty revolving around President Trump’s politics, along with ongoing tensions in the Middle East and Brexit negotiations will remain gold’s key drivers. Against this backdrop, we expect ETF demand to rebound this year to 350 tonnes, after a modest net increase of 177 tonnes over 2017. Retail investment is forecast to rise in 2018, following four consecutive years of declines, thanks to a pick-up in bar demand, supported by improving sentiment towards gold and rising price expectations. Another bullish factor is that we expect China to resume as a central bank buyer and consequently the official sector globally will acquire over 400 tonnes on a net basis. Not everything in the garden will be rosy though; we expect coin demand to slide further as this sector attracts many price sensitive investors who are likely to be discouraged by higher gold prices. Rising prices will also be a headwind to jewellery offtake and we expect this to fall by 3%, with the crucial Indian market dropping back. Furthermore, we expect mine production to rise this year, as 2017 proved to be a blip after 13 consecutive increases, supported by rising Russian output and a stabilisation of production from China. The gold price currently sits at around $1315 here on May 9, but has been above $1360 earlier this year before the dollar began strengthening in late April. And geo-political events in Iran coupled with rising inflation in the U.S. could easily see a breakout for the yellow metal due to both seen and unforeseen circumstances.